In late 2013, I took a group of my students to visit the J.R.R. 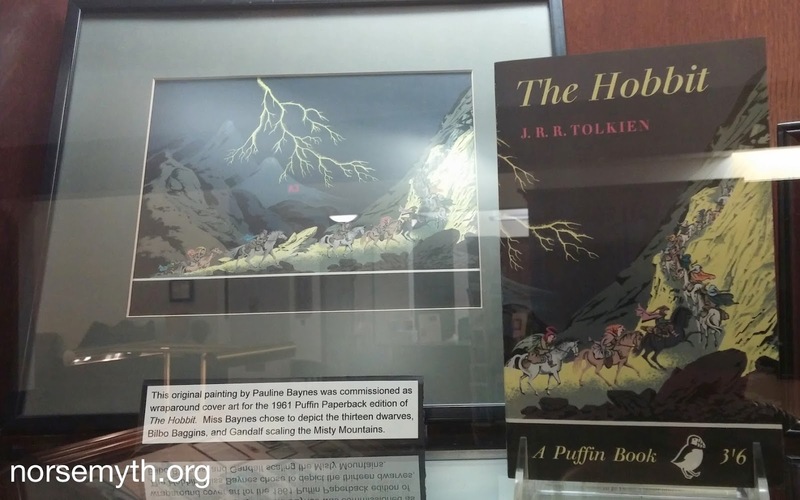 Tolkien Collection at Marquette University in Milwaukee. 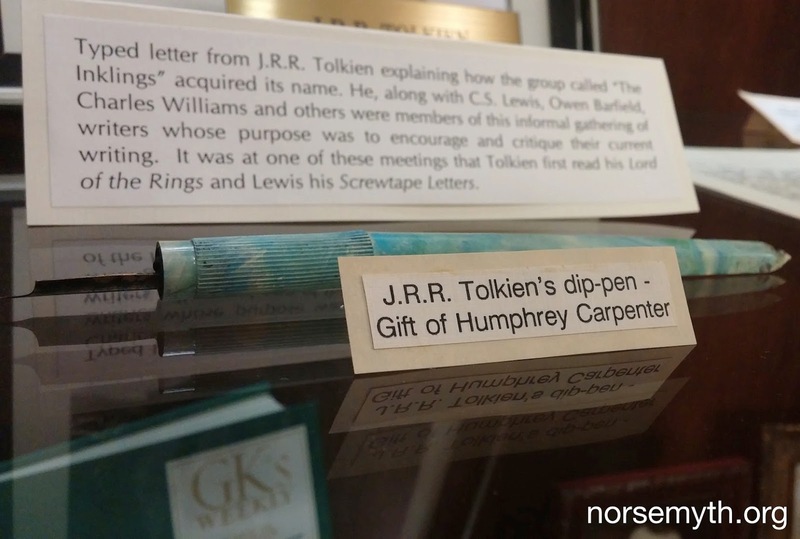 The field trip was open to students from my class at Chicago’s Newberry Library on "The Hobbit: J.R.R. Tolkien’s Mythic Sources," from my class at Carthage College on Norse religion, and from the Tolkien Society I founded at Carthage College. 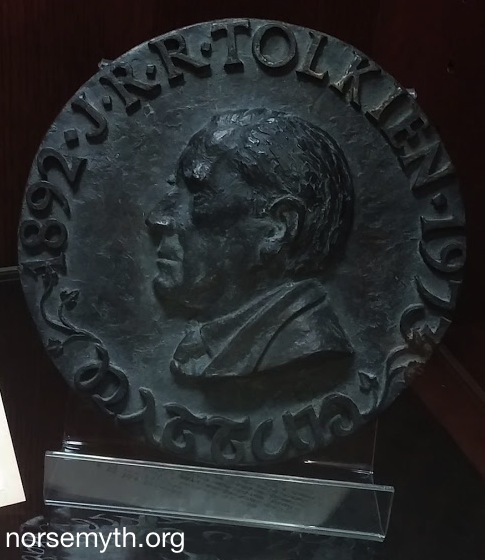 You can check out the photo essay from the 2013 visit to the Marquette Tolkien archives by clicking here. We were joined on the trip by Laura Schmidt, archivist at the Marion E. Wade Center and staff advisor for the Wheaton College Tolkien Society. She arranged the visit and brought students from her institution's Tolkien Society to tour the collection and interact with my students. This year, Laura invited me to give the Wheaton College Tolkien Society Annual Scholar's Corner Lecture. 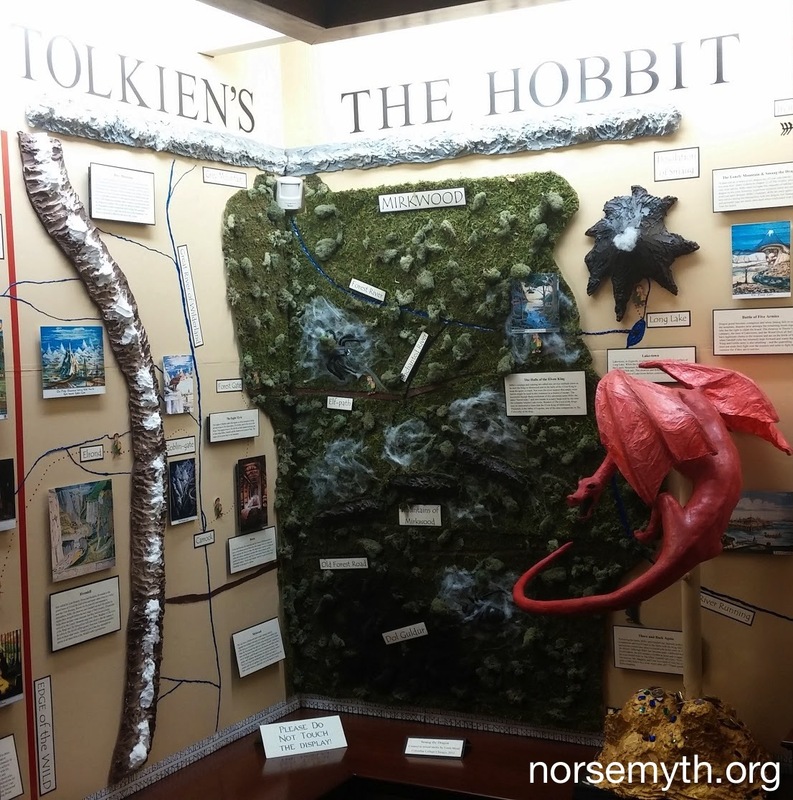 In February, I visited the Marion E. Wade Center and gave a multimedia presentation on " 'Riddles, Runes and Icelandic Dwarves': The Hobbit and Norse Mythology." Laura was a fantastic host, the capacity audience was greatly attentive, and everyone stayed for a wide-ranging question-and-answer session after the lecture. Before my talk, Laura gave me a tour of the Marion E. Wade Center's Tolkien archives and was very patient while I asked a lot of questions and took a lot of photographs. 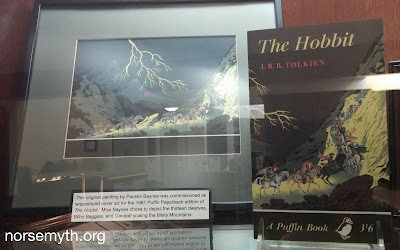 It was wonderful to see the Tolkien materials up close. 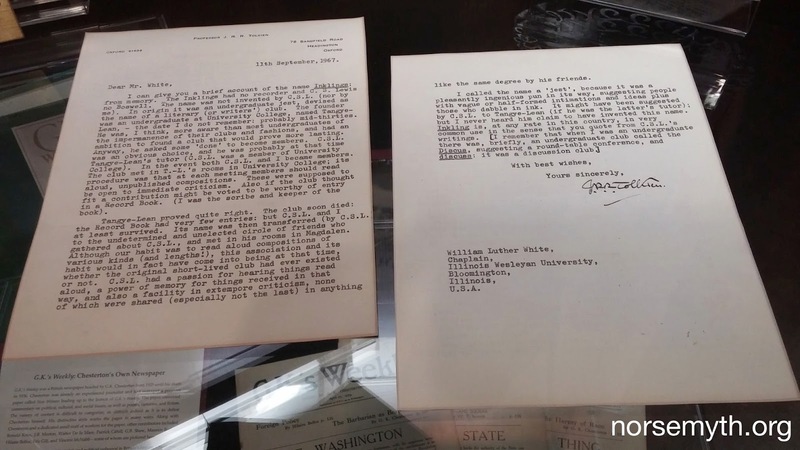 Wheaton College holds a variety of objects and papers related to Tolkien and his work. The collection was conceived in 1965 by Dr. Clyde S. Kilby, professor of English at the college, who began the preservation program by assembling letters of Tolkien's friend and colleague, C.S. Lewis. Family and business associates of Marion E. Wade, founder of the ServiceMaster Company, established the center in the businessman's memory in 1974. 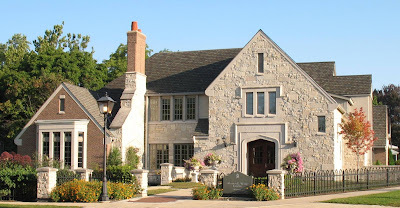 The Marion E. Wade Center moved to its current location in a faux English manor house in 2001, and it now houses a major research collection of work by and about seven writers from the United Kingdom: Owen Barfield, G.K. Chesterton, C.S. Lewis, George MacDonald, Dorthy L. Sayers, J.R.R. Tolkien, and Charles Williams. 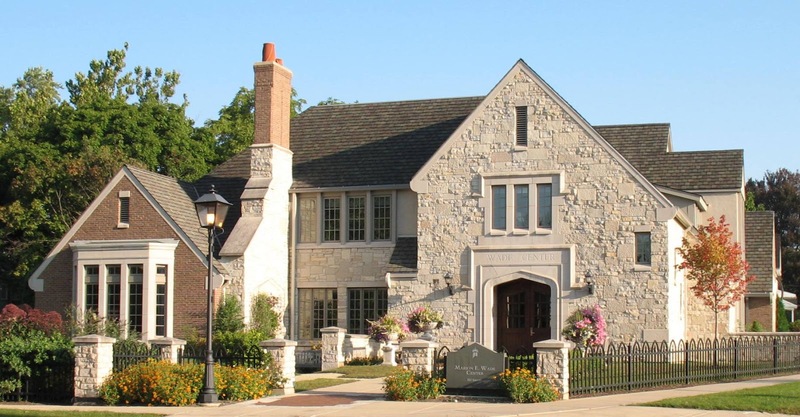 In Wisconsin, the Marquette University collection contains original drafts and manuscripts of The Hobbit, The Lord of the Rings, Farmer Giles of Ham and Mr. Bliss. In England, the Bodleian Library of Oxford University holds manuscripts of The Silmarillion, Tolkien's original Middle-earth artwork, and his personal and academic papers. 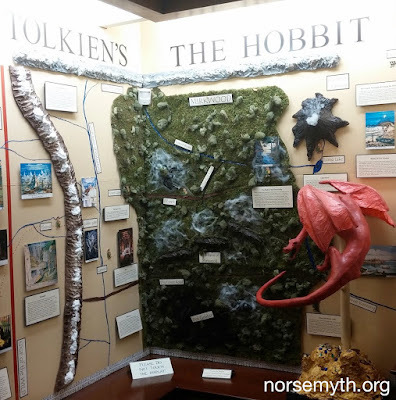 Here in Illinois, the Wade Center has its own wonderfully diverse and unique collection of Tolkien material. Note: You can click on the photos to see larger versions. The main display room of the collection features Tolkien's writing desk, the one that he used for the entire process of writing The Hobbit. 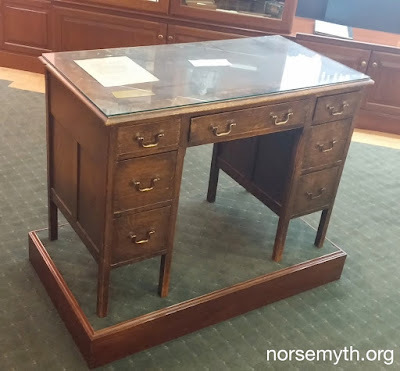 On this desk, he wrote and typed the text of Bilbo's adventure and drew and painted the illustrations that were included in the original edition. The desk was also used by Tolkien for drafting portions of both The Silmarillion and The Lord of the Rings. There is a signed letter by Tolkien on top of the desk describing its use in the creation of his Middle-earth mythology. A reminder of the long-age era when Tolkien wrote his first tales of Middle-earth, the dip-pen in the collection was given to him by Humphrey Carpenter, author of J.R.R. 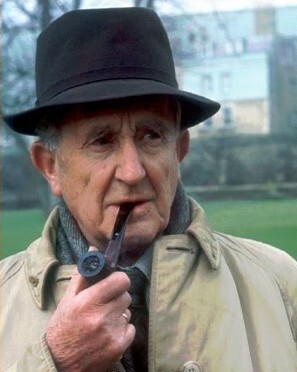 Tolkien: A Biography (1977) and editor of The Letters of J.R.R. Tolkien (1981). Tolkien used the end of the pen to damp his ever-present pipe, hence the melted material at its tip. The Wade Center also owns several manuscripts by Tolkien; you can read the current list of holdings by clicking here. "I was wrong after all," said Gandalf, "and Gimli too. Merry, of all people, was on the right track. The opening word was inscribed on the archway all the time! The translation should have been: Say "Friend" and enter. I had only to speak the Elvish word for friend and the doors opened. Quite simple. Too simple for a learned lore-master in these suspicious days. Those were happier times. Now let us go!" This typed and signed letter was written in 1967 to William Luther White, chaplain at Illinois Wesleyan University in Bloomington, Illinois. It details the beginnings of the informal discussion group than included Tolkien, Owen Barfield, C.S. Lewis, Charles Williams and others. The writers gathered to read their latest creations aloud and to critique each other's work. At one of these meetings, Tolkien performed his first reading of The Lord of the Rings. The Wade Center has an impressive collection of Tolkien's letters; click here for a detailed list. This is the original painting that Pauline Barnes created for use as the wraparound cover of the edition of The Hobbit released by Puffin Books in 1961. It shows the Bilbo Baggins, Gandalf and the thirteen dwarves as they make their way through the Misty Mountains. Next to it is a copy of the Puffin edition. Strangely, Ms. Barnes decided to paint her work at actual printing size. The minute detail of the work is very striking in person. Dr. Clyde S. Kilby, the Wheaton professor who started the collection, was given this wood carving by Jeanne Clark, a former student. The piece was created by Jim Nelson of the Ozark Folk Center in Stone County, Arkansas. Ms. Clark thought the work was reminiscent of Treebeard, the Ent who appears in The Lord of the Rings. Wade Center staff member Shawn Mrakovich made this fantastic three-dimensional map of Bilbo's journey in The Hobbit as a way to welcome young readers. From Bilbo's home in Shire across the snow-capped Misty Mountains, through spider-infested Mirkwood and past Lake-town, to Smaug and his golden treasure-hoard beneath the Lonely Mountain, the display provides a charming and information-packed introduction to Tolkien's timeless classic children's book of 1937.